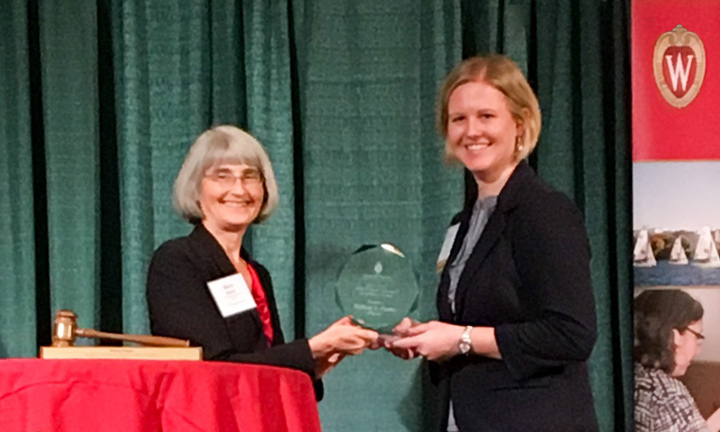 Melissa Forbes (right), clinical pharmacist at Gundersen Lutheran Medical Center, receives the 2017 IPPE Clinical Instructor Excellence Award from Mara Kieser (left), assistant dean of Experiential Education at the UW–Madison School of Pharmacy. Maximizing the learning experience for UW–Madison School of Pharmacy student pharmacists has been an enduring commitment and passion for Melissa Forbes, a clinical pharmacist at Gundersen Lutheran Medical Center in La Crosse, Wis., and Rani Raju, a clinical pharmacist at Miller Pharmacy in Mukwonago, Wis. Both pharmacists were recognized as top preceptors by the School of Pharmacy for their outstanding teaching and mentoring of PharmD students in the Introductory Pharmacy Practice Experiences (IPPE) for first through third-year PharmD students and Advanced Pharmacy Practice Experiences (APPE) for fourth-year students. IPPE and APPE programs allow pharmacy students to apply their knowledge and skills to real-world pharmacy settings. Forbes (PharmD ’10) received the 2017 IPPE Clinical Instructor Excellence Award, which recognizes a clinical instructor’s outstanding qualities, ethics, professionalism, teaching ability, and communication skills. Raju was recently honored with the 2017 Larry Boh APPE Clinical Instructor Excellence Award, named for faculty member Larry Boh, who served from 1982 to 2001 and was passionate about teaching. Students nominate preceptors for both awards. Preceptors volunteer their time to work with student pharmacists as clinical instructors. “We appreciate the dedication of our preceptors in training our student learners,” says Mara Kieser, assistant dean of Experiential Education and professor in the Pharmacy Practice Division. Pharmacy students describe Forbes as a clear and punctual communicator who customizes students’ schedules and is always open to questions. They also note her professionalism, as well as her ability to help provide greater exposure to diverse roles within pharmacy. “Melissa was very professional and one could tell that she was very well-respected by her peers. She had outstanding professional relationships with other providers within the health system,” wrote one PharmD student. Melissa Forbes, clinical pharmacist at Gundersen Lutheran Medical Center in La Crosse, Wis.
Forbes is a 2010 graduate of the UW–Madison School of Pharmacy PharmD program and also did her undergraduate work at UW–Madison. She completed her pharmacy residency at Gundersen in La Crosse, Wis., and has been a clinical pharmacist there since 2011. She took over the role of student coordination three years ago and is also one of the lead preceptors in the critical care and infectious disease department. Forbes coordinates the experiences of IPPE and APPE students, determining where they’ll be on rotation and with whom, aiming to find rotations that are the right fit for each individual student and will help them grow their skills. In IPPE rotations, Forbes integrates student pharmacists into day-to-day work, showing them everyday tasks and talking them through the thought process she applies to each task she completes in a given day. The pharmacy profession is constantly evolving, and pharmacists in big community health systems care for patients not just while they’re in the hospital, but also as they go through the hospital admissions process and after they leave the hospital. PharmD students are encouraged to see different areas of pharmacy practice in order to help them know what to expect when they leave school and possibly develop an interest in new practice areas. APPE students can select a residency track program and complete six of their eight required rotations at one institution. Forbes says being a preceptor motivates her to stay current on pharmacy best practices and latest information. Rani Raju, clinical pharmacist at Miller Pharmacy in Mukwonago, Wis.
PharmD students praise Raju’s dedication, friendliness, caring, teaching skills, and approachability. They comment on her willingness to review students’ work outside of working hours and her commitment to putting students first. “I have never met a preceptor who is so caring, who has a desire to teach, and who always puts the student first,” commented one pharmacy student. “It was like talking to a friendly peer who was trying to help me improve and care for patients more,” wrote another. Raju did her pharmacy training at Drake University and completed her community residency at the University of Iowa, an experience she loved. She earned a teaching certificate as part of the residency program’s preceptor education program. “That’s when I realized I loved teaching and sharing my passion for community pharmacy with students,” Raju says. Miller Pharmacy has invested and committed to creating a clinical practice in a community pharmacy setting, which has allowed Raju to take more time to interact with patients and hold weekly office hours for check-in meetings with PharmD students, so she can give them regular feedback. Rani Raju (right), clinical pharmacist at Miller Pharmacy accepts the 2017 Larry Boh APPE Clinical Instructor Excellence Award from Mara Kieser (left), assistant dean of Experiential Education at the UW–Madison School of Pharmacy. Raju works with UW–Madison School of Pharmacy PharmD students in their rotations for IPPE and APPE and involves them in every aspect of her daily practice. Raju aims to build on student pharmacists’ foundational knowledge and says that applying that knowledge is, for many student pharmacists, the biggest challenge they face. She also reinforces the importance of professional networks and leadership skills. “I always tell students that pharmacy is a small world, and it’s who you know,” Raju says. The School of Pharmacy’s IPPE experiential program for PharmD students includes six different regions of Wisconsin, allowing first-, second-, and third-year student pharmacists to observe community and hospital pharmacists in action. Student pharmacists complete 300 hours of IPPE experience during their first three years in the PharmD program. “This allows students to see real-life pharmacy practice and prepare for activities they will do during the APPE in their fourth year,” says Kieser. In addition to observing pharmacists at work, first-year (DPH-1) students practice their communication skills and participate in community outreach activities that provide health education and screening, as a way to promote pharmacists’ public health roles. Second-year (DPH-2) student pharmacists engage with pharmacists, as well as those in a specialty practice area of their choice. They also help patients with low health literacy navigate the health care system and participate in community outreach activities. Third-year (DPH-3) student pharmacists actively care for patients, under the supervision of a pharmacist preceptor. Students also choose elective rotations, so they can explore unique practice settings or immerse themselves even further in one area of pharmacy. Fourth-year (DPH-4) students in the PharmD program spend 1,680-1,920 hours outside the classroom, learning and practicing the role of pharmacist under the supervision of a pharmacist preceptor during their APPE rotations. Theodore Jennaro (left) and Chris Bisping (right), both DPH-4, completed their international APPE rotation at at the Hunter Medical Research Institute (HMRI) in Newcastle, New South Wales, Australia. PharmD students complete rotations in a hospital and in a community pharmacy focusing on patient care and on medication systems management. APPE students may train throughout Wisconsin, elsewhere in the United States, or in eight different countries as part of an international APPE. PharmD students also can choose non-traditional pharmacy settings such as pharmaceutical companies and governmental organizations including Food & Drug Administration (FDA), National Institutes of Health (NIH), and Indian Health Service, as well as residency track, research, and global health options. “We have a very strong APPE program that provides rich learning experiences,” says Kieser. “As pharmacy services continue to evolve, we continue to add innovative pharmacy sites. Students have a great opportunity to try out almost any type of pharmacy practice while learning from an expert. Learn how to become a preceptor for the School. Read about the UW–Madison School of Pharmacy preceptor Jeffrey Fish (B.S. ’91), who was named Master Preceptor by the American Association of Colleges of Pharmacy (AACP).